Anyhow, for those who know me, I love a little website called GOG.com. Standing for “Good Old Games,” the website aims to bring back the classics to modern machines DRM-free! GOG.com is run by CD Projekt (wiki), the guys who made The Witcher. It is this website that has refreshed and expanded my interest in older games. Prior to this, I frequented abandonware sites and have accumulated a good 8GB of DOS games. However, there are those rare gems that you can’t get a hold of anymore. Many of the games offered on GOG.com are PC gaming classics, with an ever expanding library! They release two new games every Tuesday! 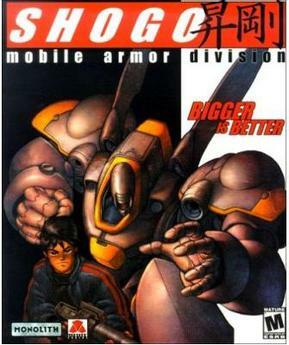 The first game introduced to the BFP segment is Shogo: Mobile Armor Division, made by my favorite game development company, Monolith Productions. “But Nick” you might say, “how can Valve, the PC gaming superstar, not be your favorite company?” Well, the short answer is I enjoyed Monolith’s games more. *gasps of blasphemy ensue* Someday I’ll explain why in further detail. Moving on, Shogo: Mobile Armor Division is an FPS built on the LithTech Engine, released September 30, 1998. As with most FPSs released in Q4 of 1998, it was overshadowed by Half-Life. As apparent from the game art, the game is influenced by anime. While not cel-shaded, the game still carries the anime style well. When enemies are shot they bleed profusely, sometimes getting blown apart if enough damage is done, splattering blood on the walls. For those who don’t know, it is a law in anime that the average character has about 4 gallons of blood. The only thing I will mention about the story is that it’s very reminiscent of Gundam, but on a simpler, more understandable level. Gameplay is split into two segments, the mech and on-foot segments. In the mech segments you pilot a mech of your choosing with each mech having its own strengths and weaknesses. These segments really do make you feel like a giant robot, as your are gigantic compared to the other non-mech enemies. Eventually you get to cause rampant destruction in cities. This combined with the explosive based weapons can create lots of fun and mayhem. The on-foot segments are more traditional. However, the challenge presented is greater than the mech segments, as you die much more easily in the on-foot segments. Each segment has their own weapon sets and level types and Shogo keeps the pace more interesting by not keeping you in a mech or on-foot segment for too long, providing a nice balance between the two. One last thing I’d like to mention is the voice acting. Put simply, it is actually quite excellent. Too bad there wasn’t more dramatic scenes in the game to use the voice actors’ talents. The voice actors understood their roles perfectly and hammed up the performance when necessary, creating a nice blend of comedic and serious vibes. I enjoyed Shogo very much. It was definitely worth my six bucks. While not the longest FPS, as I beat it in one afternoon, it was enjoyable nonetheless. If you like FPSs, I’d say buy it. You can’t go wrong, and with the price point, it’s not going to hurt your budget either. This post was published 3461 days ago, content in the post may be inaccurate, even wrong now, please take risk yourself.